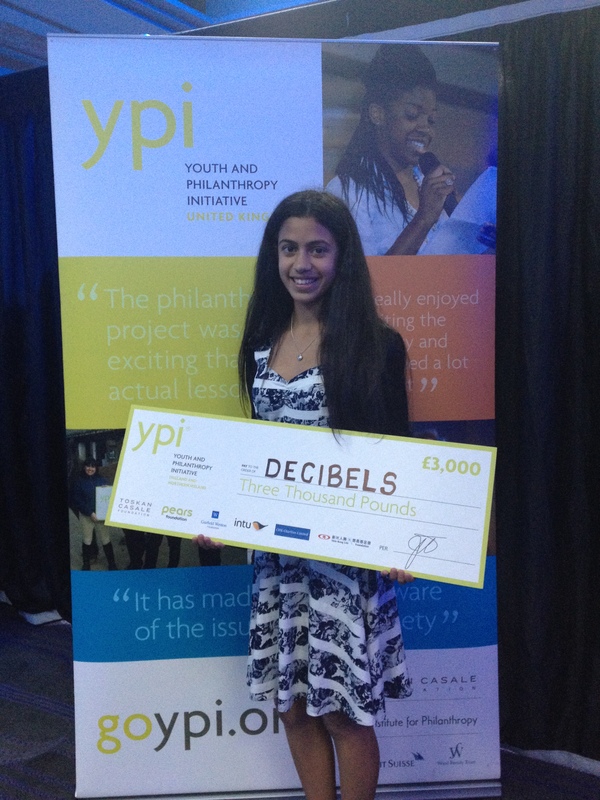 Decibels has recently received £3000 funding from the Youth Philanthropy Initiative, thanks to students at Leighton Park School in Reading. A group of students took it upon themselves to represent and nominate Decibels as a worthy cause for the money. And guess what….WE WON!! One of these students, 15 year old Aiyana Tandon, showed a particular interest in the charity and joined Ken Carter (Founder) and Kayleigh Wright (Creative Arts Manager) on the Decibels team, for her work experience week. She continues to work closely with us on the project benefiting from this funding, ‘Hands on Shakespeare’. When presented with the challenge of choosing just one charity from hundreds in the Berkshire County, the task appeared difficult. Our aim was to select a charity which we felt strongly about and could definitely benefit from a £3000 grant. At first, our search did not reveal a cause that we were all entirely enthusiastic about supporting but once we stumbled across Decibels, we were adamant that we had found a charity with inspiration, innovation and ideas that could use the money in a way to make a difference. At Leighton Park School, the year ten students, including myself took part in a competition called the Youth Philanthropy Initiative. Divided into 20 groups each consisting of four or five students, we were to find a charity that we wanted to support, and then create a presentation about the charity that consisted of creativity, information, and emotion to a panel of judges which would decide who would be given £3000 to donate to their chosen charity. I am extraordinarily grateful that I was able to take part in this event not only because we did succeed in gaining £3000 for Decibels but also because I now have a fantastic opportunity to work with Decibels in future projects. For this, I am incredible grateful to Rachael Martin, an inspiring teacher, who brought the Youth Philanthropy Initiative (YPI) to our school. I was thrilled to discover that Ken Carter, the founder of Decibels, was willing to give me a week work placement with Decibels. Over the week Kayleigh Wright, graduate of the TAEDS course and creative director of Decibels helped me to understand Decibels work and kindly accepted me onto Decibels new project, “Hands-on Shakespeare.” The money from the YPI grant would be in aid of this project so I am extremely keen to be a part of it. During my week of experience I have looked at marketing, research, funding applications, project development and even given the opportunity to experience and help to facilitate two different workshops. I was particularly delighted to see a “colour music” workshop run by Ruth Montgomery at Addington School in Reading. The response from the children to Ruth’s display was a joy to watch. Throughout the day, two workshops were run with groups of different ages. The morning session consisted of children between the ages of 9 and 11 with a variety of disabilities. As Ruth demonstrated several techniques which can be used in music, the children were given the opportunity to play loud and soft, fast and slow, smooth and spiky on some percussive instruments. It was fascinating to watch keen faces begin to grasp the concepts and as they then tried to draw the music into a picture, it was clear they were having fun as well. Ruth played several contrasting pieces on a flute which indeed mesmerised and inspired the children’s artwork. The variety of media available from coloured paper, tissue paper, pens and pencils certainly aided the activity in being fun and engaging. There was clearly a feeling of delight and pride amongst everyone at seeing the works of art displayed on the floor showing the music recently played by the flute. The second group contained people between the ages of 18 and 19 with a range of cognitive disabilities. Considering this was my first time experiencing the education of with people with disabilities, I had no clear expectations. I believe that at the beginning it was more difficult to gain a response from the participants but once Ruth spoke again with such clarity using movement and visual images, the interest of the room grew and everyone was soon able to play the instruments and succeed in making a picture that embodied Ruth’s music. By the end, there was obviously a greater understanding and a new enthusiasm in both workshops. I found that by using visual aspects coupled with sound, people are drawn out to enjoy and learn actively, the colour music workshop illustrated this perfectly. Over the week I had the pleasure to meet many inspirational people, most of which were fluent is BSL. From watching people sign to each other, it has certainly sparked an interest in me and I am curious to learn more about it. I look forward to what the future will bring and how the “Hands on Shakespeare” project will grow and hope that my involvement with Decibels will not end here. It is Deaf Awareness Week!! Decibels believes in an inclusive world! We hope that everyone is taking up the challenge to learn some Sign Language! One place that there should be deaf awareness is within the NHS, can you imagine being ill and nobody being able to tell you how, why or what is wrong? or maybe they don’t even tell you anything directly, because they are scared to try. There have been many stories of scary and isolating experiences within the NHS, and it is clear that the lack of Sign Language knowledge in the health care profession is a serious problem. This heart breaking story of how Matt Dixon was expected to interpret for his ill father throughout his battle against cancer, lead to him having to sign to him that he was going to die. It makes us see that not only deaf people are affected by the lack of awareness and understanding in the NHS. AND finally some hope… as this mother and nurse encourages the ward she works on to learn and use sign language. A wonderful attitude towards a change that should be made! It is clear that there needs to be more deaf awareness within the NHS and the world. How will you make sure that you are deaf aware? Scope’s “End the Awkward” campaign. Give this great blog article, by Abigail Budd, a read! It shares her experiences as a disabled person. Inspired by Scope’s “End the Awkward” campaign, this article rightfully points out the ‘avoidance’ attitude of the public, rather than a negative one. Budd tells an interesting and positive story of her interviewing experience but recognises that not all disabled people are fortune enough to have such a story to tell. Decibels are hoping to offer, in the near future, an interview preparation workshop. It will aim to empower deaf and disabled people, using theatre and role play to build confidence and skills! Watch this space!! Decibels is a charity in Reading. We design and deliver projects, locally and Nationally, providing music, theatre and art opportunities not only for EVERYONE but in an accessible way for deaf and disabled people. We aim to build confidence, as well as communication, interactive and creative skills. And most of all have fun! We get up to some exciting stuff here at Decibels…so we have started this blog, so that YOU can stay up to date with what we have been up to, and find out how YOU can get involved. And subscribe to this blog for MORE updates….